Download Windows Media Player or Apple QuickTime Player to play frog calls .mp3 audio files if your PC doesn't play these calls. 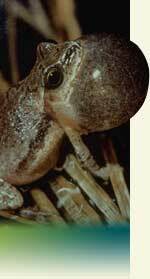 Frog Calls are from the "Frogs and Toads of the Chicago Region" CD available to monitors for the Calling Frog Survey. The calls were provided by Lang Elliot, Nature Sound Studio.